Climbers and officials in Nepal are worried that global warming is making the glacial environment unsafe for humans in the Himalayas. They say human settlements and activities such as mountaineering are threatened by glaciers retreating and glacial lakes growing both in number and size. As the effects of climate change become ever more visible in the central Himalayas, Nepal's mountain community is worried by the rise in precipitation across the region, including popular destinations such as Mount Everest and the Annapurnas. Ang Tsering Sherpa, the president of the Nepal Mountaineering Association, says expedition teams are facing new hazards en route to the peaks, which he believes are caused by global warming. "Climate change has made the weather conditions extremely unpredictable across the mountains," Sherpa, who has been organising Himalayan expeditions for nearly two decades years, told the BBC. "For example, in seasons when we don't normally expect any snowfall, we see heavy snowfalls. And in seasons when we expect heavy snowfalls, we have no snowfalls at all. We are worried." Sherpa says changes in the weather have affected mountaineering and other activities. In October 2005, 18 expedition team members - French climbers and Nepalese sherpas among them - were killed in a massive avalanche on the 6,981m-high Mount Ganguru in western Nepal. Ang Tsering Sherpa says climate change was to blame for heavy snow which caused the avalanche. "Normally we don't have snow in October." Two years on, he says, mountaineers are now monitoring the effects of climate change on the peaks. This year, Japanese alpinist Ken Noguchi is climbing Everest as part of his Everest clean-up expeditions. He says that beside collecting rubbish from the world's highest mountain, his team will compare and analyse the impacts of global climate change on several glaciers in the Everest region. "Climate change has affected the Himalayan ecology, its snowfall patterns," Noguchi said, before leaving for Advanced Base Camp. "We can clearly see that when we go to the mountains and observe the glaciers and lakes there." Nepal is home to most of the world's highest mountains. Recent analysis of weather data suggests that global warming is real. Average temperatures are rising annually at a rate of 0.06C in Nepal, according to the country's Department of Hydrology and Meteorology. "Global warming rates in different parts of the country vary," says Saraju Baidya, a meteorologist at the department, which has been collecting data from around the country for 30 years. "In the Himalayan region, we have found out that the rate of warming, on average at 0.12C, is higher than in many places." He and his colleagues say climate change has caused glaciers in the northern Himalayas to retreat at a rate never seen before, posing the threat of 'glacial lake outburst floods' (Glofs). Experts like Mr Baidya say there were hardly any glacial lakes in the Himalayas 50 or 60 years ago. Today, however, things have changed. There is growing concern that an earthquake or excessive precipitation could prompt Glofs, washing away villages and destroying infrastructure such as hydroelectric plants and bridges along river basins. 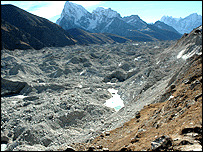 More worryingly, melting Himalayan glaciers could have a huge impact on water resources and river systems across Asia. According to a recent inventory carried out by Nepal's International Centre for Integrated Mountain Development (Icimod) and the United Nations Environment Programme (Unep), there are 3,252 glaciers and 2,315 glacial lakes in Nepal alone. 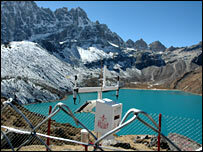 Of them, 26 glacial lakes are considered to be potentially dangerous. A similar inventory of Bhutan found 677 glaciers and 2,674 glacial lakes, of which 22 are potentially dangerous. Between 1977 and 1998, five Glof events occurred in Nepal, causing significant loss to infrastructure and human settlements. Similar destruction has also been caused on a number of occasions in Nepal over recent decades by glacial lakes bursting in neighbouring Tibet. At the Tsho Rolpa glacial lake in northern-central Nepal, a drainage project was completed a few years ago to prevent such risks. Experts say more action is needed now. "We haven't studied much except analysing satellite images, it's about time we did a fresh survey and prepared an inventory," says Sandip Chamling Rai at the Climate Change department of the World Wide Fund's Nepal programme. Arun Shrestha, a climate change specialist at Icimod, adds: "Equally important is ground verification of the sites. Only then only we can take mitigation measures." 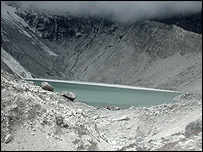 Images courtesy of WWF Nepal and Unep.